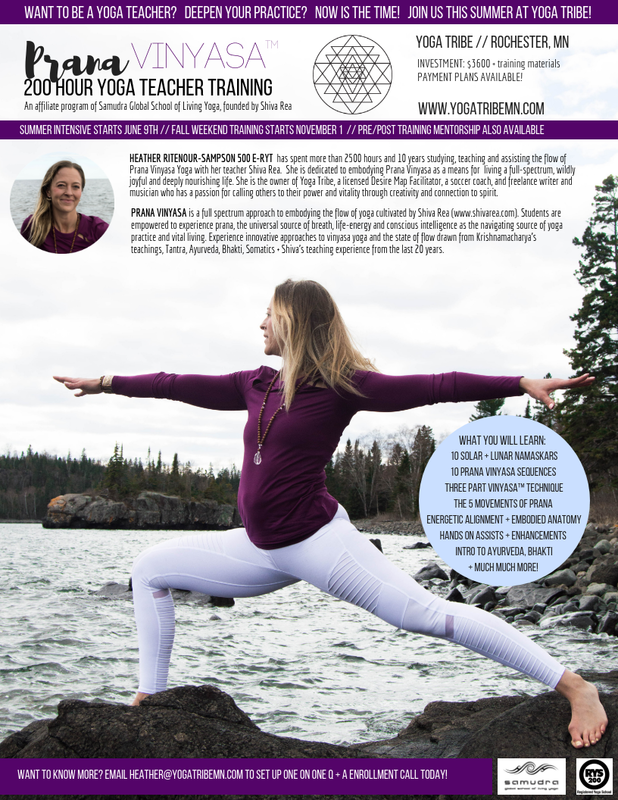 Join me this summer or fall for the ONLY 200 hour Prana Vinyasa™ yoga teacher training in Minnesota. This is your opportunity to dive in fully to the art of living yoga, and you don't want to miss it! This yoga teacher training will take you into the specifics of Prana Vinyasa yoga, a style of yoga I honestly discovered "by accident" 10 years ago when searching for a yoga teacher training program. It seemed reputable. The dates worked. So I signed up. And then, the first night of the training, as I moved and breathed with a room full of radiant hearted strangers at a retreat center tucked in the Berkshire mountains I felt this deep sense of coming home as tears streamed down my face. AREAS OF STUDY: Prana Vinyasa foundations, technique and history including the Three Part Vinyasa Method™, 10 solar and lunar namaskars, 10 Prana Vinyasa™ sequences, the Prana Vayus, energetic alignment, embodied anatomy (taught by retired physician Patricia Barrier), and an introduction to hands-on assists and adjustments, as well as ayurveda, pranayama, meditation, and mantra practices. WHAT IS PRANA VINYASA YOGA? Prana Vinyasa is a full-spectrum approach to embodying the flow of yoga created by Shiva Rea. Students are empowered to experience prana, the universal source of breath, life energy and conscious intelligence as the navigating source of yoga practice and vital living. Click here for more information about Shiva Rea and Prana Vinyasa™ Yoga. "Balancing in yoga and life is a reflection of our inner state. Can we dance with change? Can we fall and try again with playfulness? Do we have the focus, skill and attunement to find the still point within it all?" HOW LONG HAVE YOU BEEN PRACTICING YOGA, AND WHAT STYLES? HOW FAMILIAR ARE YOU WITH PRANA VINYASA YOGA? WHY DO YOU WANT TO BE A YOGA TEACHER? ARE YOU AT A PLACE IN YOUR LIFE WHERE YOU ARE READY FOR DEEP TRANSFORMATION? HOW DO YOU KNOW? WHAT DO YOU HOPE TO LEARN FROM THIS PROGRAM? DO YOU HAVE ANY PREVIOUS CERTIFICATION/TEACHING EXPERIENCE? DO YOU HAVE ANY INJURIES/PHYSICAL LIMITATIONS WE SHOULD KNOW ABOUT? DO YOU HAVE WHAT IT TAKES TO BE 108% COMMITTED TO THIS TRAINING? HOW DO YOU KNOW? WOW! Before you do ANYTHING, take a moment to breathe in this amazing commitment you are making to yourself! You are right here, right now, for a reason! Change, expansion, and growth are on the horizon!